Like the Junior Footlight this is a great jazz or dance shoe. It features a soft leather upper, a suede sole, and a cushioned insole for shock absorption and comfort. The heel measures 1.5" high, is fully wrapped in leather to match to upper, and has a non-slip heel counter. Its neutral styling and shape make it perfect for a host of periods, settings, and looks. The suede Junior Footlight is colored as pictured. Order your street shoe size. Please note that this shoe is not designed for use with taps. 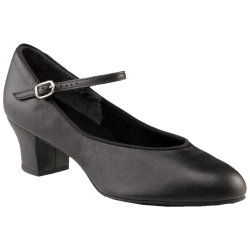 For a character shoe that can be worn with taps please see the Capezio Junior Footlight 550. Use the drop-down box below to select your size.